La chaîne en gaélique TG4 consacre plusieurs émissions au soulèvement de Pâques 1916. 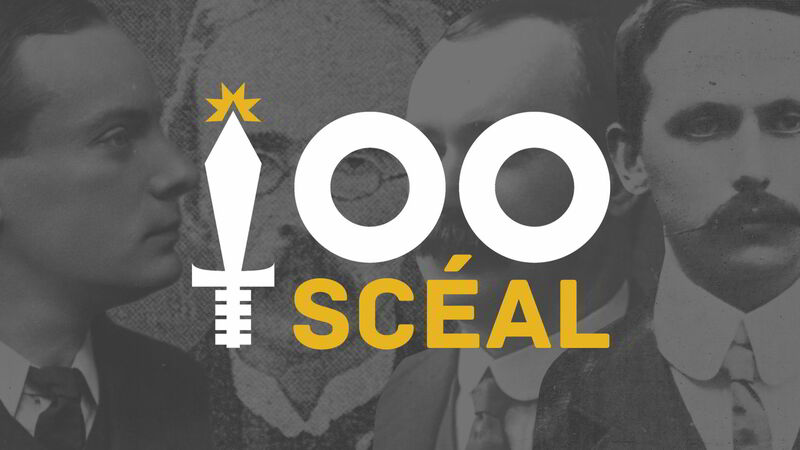 TG4 marks the 1916 Centenary with a combination of jewels from our archive and some bold new content, Wednesday nights at 19:30 will re-show Seachtar na Cásca: profiles of all of those executed after the Rising. TG4 is also dedicating a prime time slot on Tuesday nights, 9.30pm, as a showcase for a series of major documentaries that focus on some of the stories, events and personalities that shaped the nation in the decades that followed. This film tells the stories of some of the babies born between 1916 and 1922. These are the children born at the beginning of a divided nation. As we reach the 90th anniversary of the Irish Civil War we hear their personal accounts of the world that they were born into, their parents, their families and what became of their lives in a country that was changed forever. Máire Mhac an tSaoi, Máire Mc Swiney Brugha, Paddy McFlynn, Uinsionn Ó Gairbhí, Proinsias Ó Conluain and Canon Alfred O’Connor all contribute to the programme. 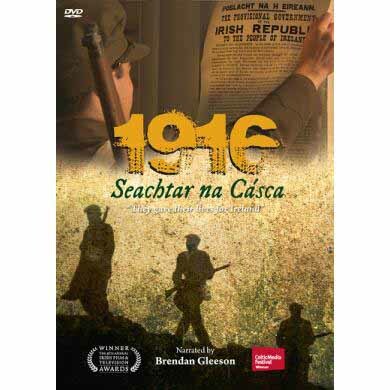 Documentary on the 7 signatories of the 1916 Easter Proclamation. This episode tells the story of shopkeeper, tobacconist and old Fenian Tom Clarke who many believe was the brains and driving force behind the 1916 Easter Rising. Born on the Isle of Wight, to a family whose father served in the British Army, Clarke grew up to be a prominent Fenian, was jailed for 15 years for his part in a failed bombing campaign in England and put together the Military Council that went on to plan the Easter Rising. 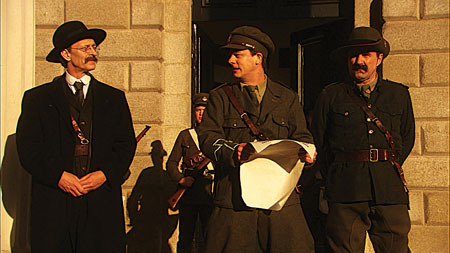 He was the first to sign the Proclamation and was executed by firing squad on May 4th 1916. A new and timely documentary which examines the life and legacy of a small farmer from Co. Donegal who left a rich legacy of songs and whose little donkey and cart almost caused a revolution! Niall Mac Giolla Bhríde was no ordinary small farmer. He was a committed Irish speaker. In 1905, returning from market day in Dunfanaghy, he was stopped by an enthusiastic policeman. He was summoned to appear in court – his crime that of having ‘An Trucaillín Donn’ displayed in Irish on his donkey cart. The ripple effect caused a campaign to change British government policies towards the Irish language. Thomas MacDonagh was born in 1878, the eldest son of two primary school-teachers in Cloughjordan, Co. Tipperary. He went to Rockwell College in 1892 to study for the priesthood but left again in 1901 abandoning his vocation. A playwright, poet and university lecturer MacDonagh commanded the Volunteer forces in Jacob’s Biscuit Factory during the rising and was jailed after like all the other leaders in Kilmainham Jail. MacDonagh was executed on May 3rd 1916 leaving behind a wife and 2 children – Donagh and Barbara. The one they feared the most; the capable, able, principled traitor who betrayed his country, his class, his culture and paid with his life. The programme traces Childers’ extraordinary conversion from staunch British Imperialist growing up in County Wicklow to hard-line Irish Republican executed by the Free State in 1922 for possession of a handgun given to him for his own protection by Michael Collins. Patrick Henry Pearse was born in 27 Great Brunswick Street (Now Pearse Street) on November 10th 1879. He was a poet, teacher, barrister and writer, but to many he is seen as the embodiment of the 1916 Rising. It was Pearse who read the Proclamation on the steps of the GPO on Easter Monday April 24th 1916. As President of the Provision Government Pearse signed the surrender documents at the end of Easter week and was the first of the signatories to be executed on the morning of May 3rd 1916..
Cette entrée a été publiée dans Ireland 1916-2016, et marquée avec année 2016, Irlande 2016, Pâques 1916, TG4, le 6 janvier 2016 par irlande2016.